More than 10 years ago when Video City (VHS video rental house) was still the “in” thing to do to catch-up and see previous movies people failed to see in the cinemas (pirated DVDs were virtually non-existent and is sooo illegal then, now its not so illegal anymore hahaha! ), I stumbled upon a VHS of the 10th anniversary concert of Les Miserables at the Royal Albert Hall. I rented it out in Video City good for three days without expecting and knowing what to see, hear and experience. As soon as the rented VHS tape was running, I was stuck like a barnacle on my seat shrieking silently without blinking an eye. I was surprised to see Lea Salonga magnificently singing the part of Eponine. Salonga was just perfectly phenomenal for the signature song of Eponine ‘On My Own’. But the most chilling number was the “I Dream A Dream” song powerfully sang by Ruthie Henshall. The concert was just a concert and it was not even the actual musical play but the emotional impact it gave me is far beyond the confines of my senses. Video City would not want to sell the said VHS during that time and I failed counting how many times I rented it out. I suppose, the said tape spent more days in my house compared to the number of days it spent on the shelves of Video City. I stopped renting it when I discovered the same concert in YouTube. 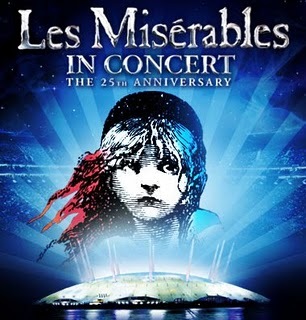 Just last night, I stumbled into a website announcing the 25th year anniversary concert of the durable Les Miserables on October 3. Surprisingly, Lea Salonga will be again in said concert singing the songs of Fantine this time. There will be no more Video City to rent a VHS tape of this captivating 25th anniversary concert. Therefore, I pray to the mighty Lord that He work on with His Holy Providence to grant me this awesome wish. I wanna see it, I wanna feel it, I wanna hear it, I wanna experience it! However, I’m running out of precious time because according to the official website, the tickets for 7:00 PM show is now sold out and there are few remaining tickets for the 3:00 PM matinee… But my faith is so heavy-duty that miracles will happen and I am sooo convinced that I will be seeing myself inside the O2 Arena in London on October 3, 2010 at exactly 3:00 PM. ← A Spectacular Jellicle Ball in Manila!